The name just about says it all. Flirt.com is a site for the playful online dater, which provides a fun and interactive experience while you search for a suitable match. Well-constructed and engaging, there are plenty of tools which make it easy to contact and communicate with other users. The “Flirtcast” enables you to reach out to multiple users at once, while the “like gallery” is a great way to rate profiles and express exactly what you like. And with more than half a million members, there are more than enough people just waiting to flirt with you. There is plenty to keep you busy and entertained at Flirt.com. For a start, getting in touch with other users is made easy with numerous options, including private e-mail, instant messaging and the chance to send a suggestive “flirt.” Usefully, “Flirtcast” means that you can tell multiple users at once that you are interested. There is also a translation tool, which means that language need not be a barrier to flirting with people across the world. Meanwhile, video chat is a great chance to get to know an individual better. If you want to interact with multiple members, then get involved in the busy chat rooms. For simply browsing, it is a good idea to check out the “Like Gallery,” which gives you the chance to rate profile pictures as “hot or not.” Not only is this a great way to browse other members, but it is a good method for refining your search. And if you are a particularly adventurous user, then you can fill out a “naughty CV” which will likely catch the eye of like-minded members. Getting started on Flirt is very straightforward. All you need to do is to submit some very basic details such as your gender, date of birth, location, e-mail address and password. You will then be sent an e-mail with a verification link in order to confirm that you are a legitimate user. Having done so, you will then be able to log in to your account. It is worth taking just a few short minutes to select a screen name, construct a very short status and describe what you are looking for. Finally, you have the option to upload photos to your profile and you are ready to go. Singles on Flirt.com can explore and use the site safe in the knowledge that they are doing so in a secure online environment. Users can select the “safe” mode which means that only “trusted” members who have confirmed their identification can contact you. Meanwhile, paid members can view profiles anonymously and block any problematic users. And there is also a page of online dating tips which is well worth reviewing. Great news for female members - you can use every feature at Flirt.com absolutely free. It’s as simple as that. However, men will need to choose whether to pay for membership or not. Free members are restricted in their usability and can contact other users only through one free e-mail and winks. So, as any Flirt.com review will tell you, if you want to get the most out of the site, it is worth becoming a paid member. The 3-day trial is a good way to start at $4.47. 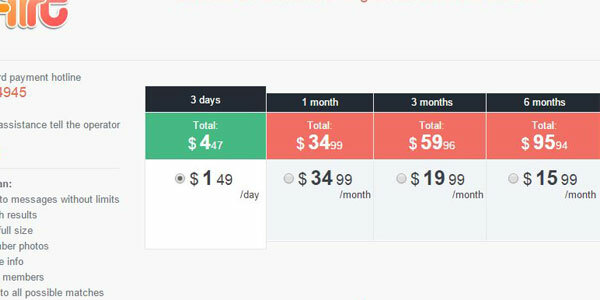 Meanwhile, a 1-month membership package costs $34.99, a 3-month deal works out at $19.99 per month and membership for 6 months will cost $15.99 monthly. This is a site which not only has a design which is pleasing on the eye, but also provides an extremely simple to use interface. And so you will have direct access to pretty much everything you might need from your personal dashboard – Your inbox, chat rooms, the search function, winking and plenty more is just a click away. Also, you can organize all users who catch your eye into a useful favorites list. And if you want to keep track of everyone you have been in touch with, then the activity feed displays your history at a glance. There is also a mobile app, which can be synchronized with your Facebook account for ultimate convenience on the go. Finding the right person is the essence of any online dating site and Flirt.com has the search function just right. Numerous potential matches with be automatically presented on your dashboard when you sign in. These options are based on the information you will have submitted. But if you want to be more proactive in your search, there are plenty of opportunities to narrow down your quest. The basic search will allow you to filter users by broad categories such as age, location and gender. 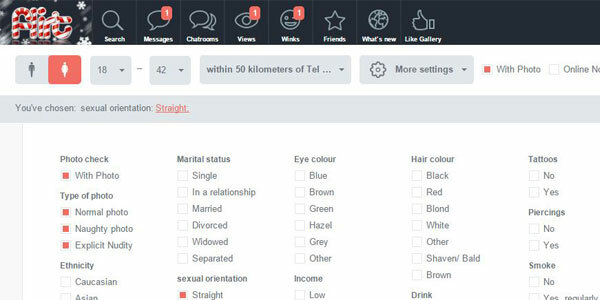 However, the advanced search lets you find someone using a wealth of criteria, including lifestyle and physical features. And there are some innovative search functions too. For example, you can find someone based on the “most responsive” users. If you are looking for a site which puts fun first, then this is just what you have been looking for. If on the other hand, you are determined to find the love of your life, then check out our review of the excellent Match.com. At flirt.com though, you will find an extremely usable site which contains excellent tools enabling you to locate a match, flirt and have fun almost instantly. For a fun and flirty dating experience, this site is highly recommended.